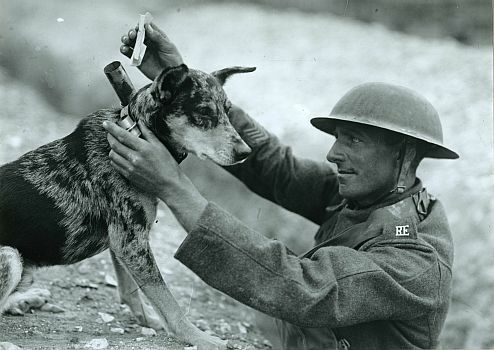 Animals in wartime are not only potential victims. Sometimes they are part of the military. For decades, not only dogs but dolphins and sea lions have been used by the military in the course of wars. In fact, the US NAVY actually has an entire marine mammal division and recognizes that it was already operational during the Vietnam War. People report that the USSR had the same sort of division in its time. The US NAVY says that the animals are only used for exploratory missions, to find objects (such as mines) and report back to the humans. Other say that animals are actually taking part in combat. In any case, these animals are part of the military and are deployed in combat zones. Which brings up a lot of questions of international humanitarian law. Q1 – Are animals traditionally relevant in international humanitarian law in any way? Q2 – What would be the statute of a minesweeper animal under international humanitarian law? Is the minesweeper dog or dolphin a combatant? A weapon? Q3 – Would you say it is legitimate for a soldier of the opposite side to kill an animal that is used as a minesweeper? Q4 – If the minesweeper animal is captured, is he or she a prisoner of war? Q5 – What would be the statute of an animal used as a combatant? A dolphin that would carry explosive to sink a vessel for example.